On the left side though, there was still about four feet of space to the ceiling that needed something with some height to fill it, but for years I just couldn’t decide what. I’m all for asymmetry, which is why I did stuff on the right only for a while, but I’ve been thinking the whole time that a big piece of art or two on the left side would look amazing, and take up some of that visual void. I loved a few pieces at local art festivals but sadly I just didn’t (and don’t) have a few hundred to spend on a piece that big. 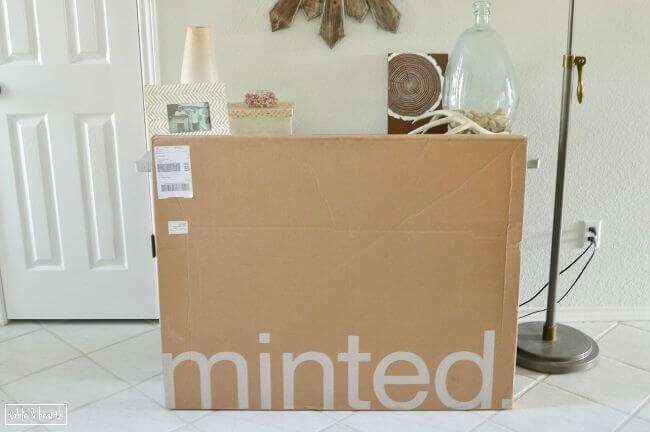 Enter Minted! I’ve shopped Minted quite a bit for invitations and business cards, and even have a small print from there on our office gallery wall. It’s like having a constant art festival to shop, and you can even pick out frames so when you receive it, it’s totally ready to hang up. I had so many pieces saved to my favorites (30!) that it took me like three weeks to narrow it down to one. 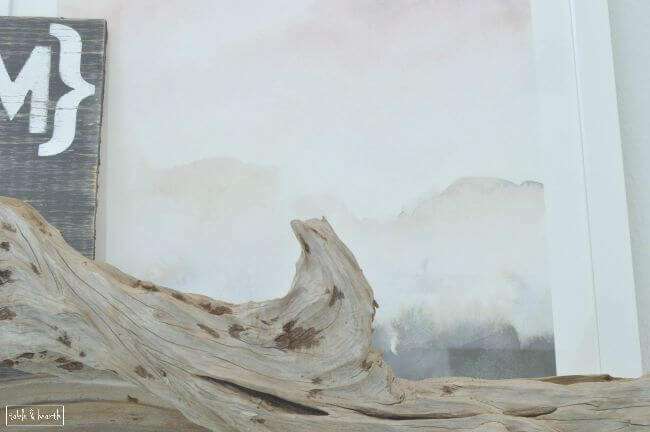 I finally decided on a 24″x24″ print of “Wake II” by Lindsay Megahed from their Limited Edition Art collection. 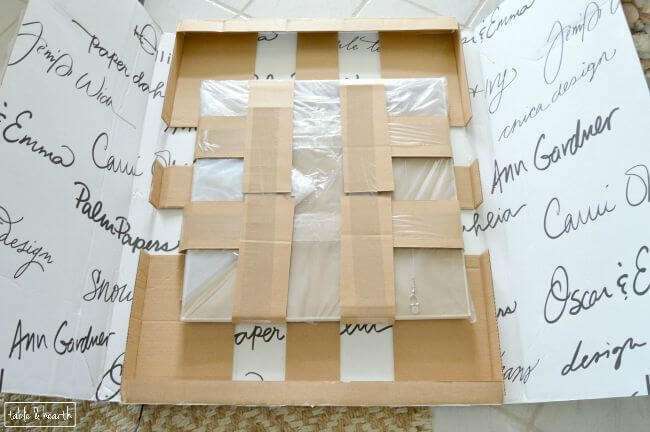 It was at my doorstep within a week and was packaged so carefully and safe! My print came with a certificate of authenticity and some information behind the artist. 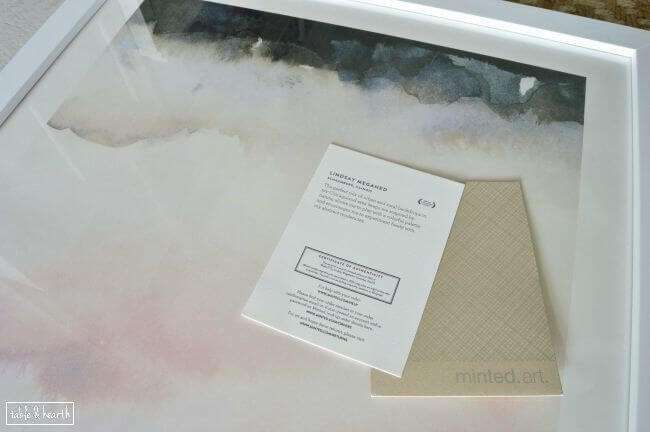 I absolutely love that Minted is completely made up of independent artists and most pieces are a small collection limited in number (mine was one of only 350). All of their art, stationary and invitations, party decor, home decor, even fabric, is from individual artists and the collections are constantly changing, with styles to fit all sorts of tastes and price points. 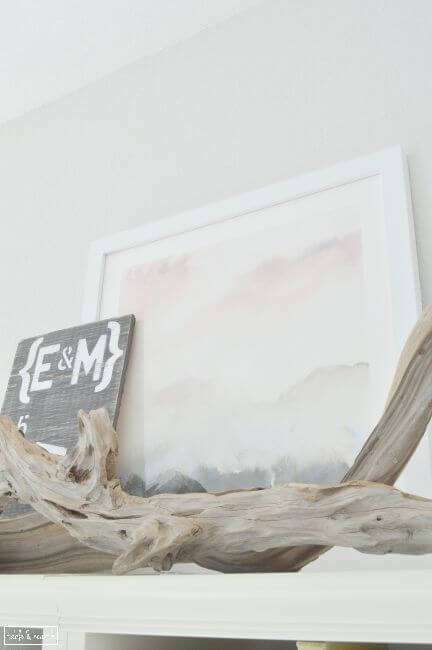 I loved the distressed and whitewashed frame options but decided to go with the plain white because it was going right behind two big pieces of driftwood from the beach. I thought the simplicity would be nice instead of too much texture. The pale pinks, grays, and charcoal bottom reminded me of the dark ocean at sunrise when we’re offshore. 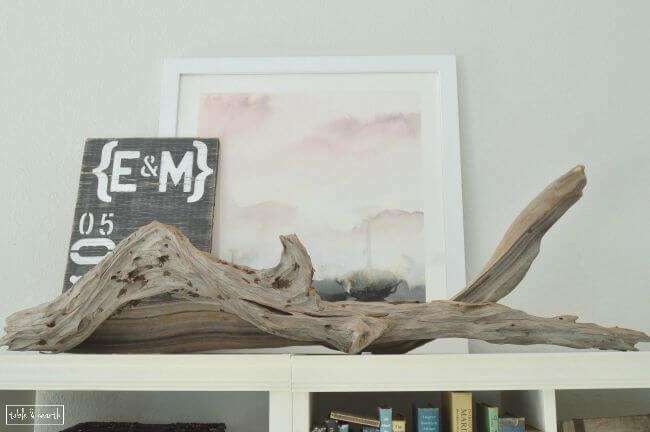 The pink is a nice accent among all my neutrals too, and I love how it looks against the driftwood! 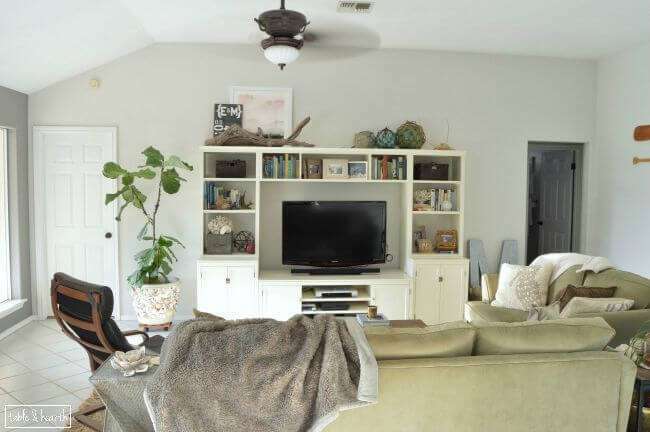 The 24×24″ was the perfect size for that side of the entertainment center and I just love how much more balanced the space feels now with it and the driftwood pieces. I also whipped up this little weathered anniversary art to accompany it which I will be blogging about soon, stay tuned! 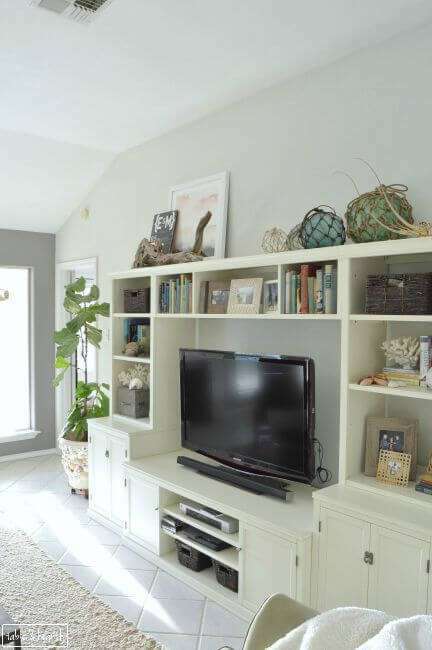 The gray in the art also ties in the gray of our fireplace accent wall, along with the darker finish of the console table at the other side of the room (the anniversary art is the same color). 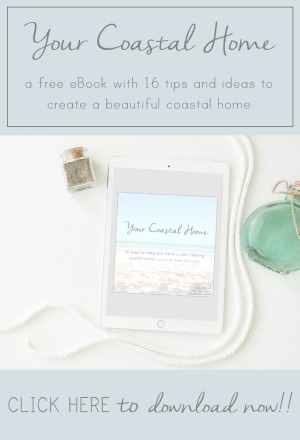 Just look at those perfect beachy colors and textures!! 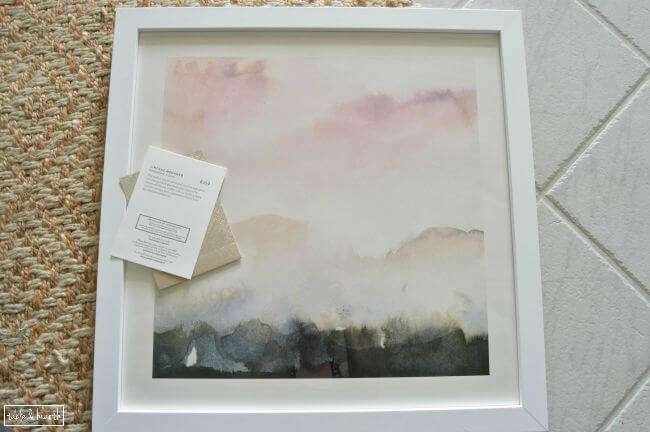 I found the absolute best piece for this space…and about a dozen other gems at Minted that I also want to find homes for :) If you’re looking for unique and gorgeous art pieces for a gallery wall, amazing fabrics, or cute invitations, save-the-dates or party decor, definitely check them out! Very nice. It does fill in the space well. 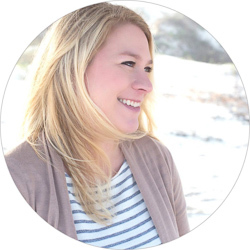 I’m a big fan of Minted! 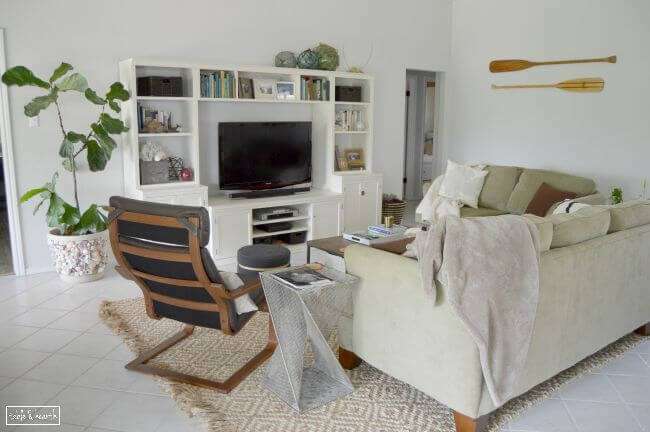 The print you chose is gorgeous and it looks perfect in your living room. YES it is!! Thanks for the party!